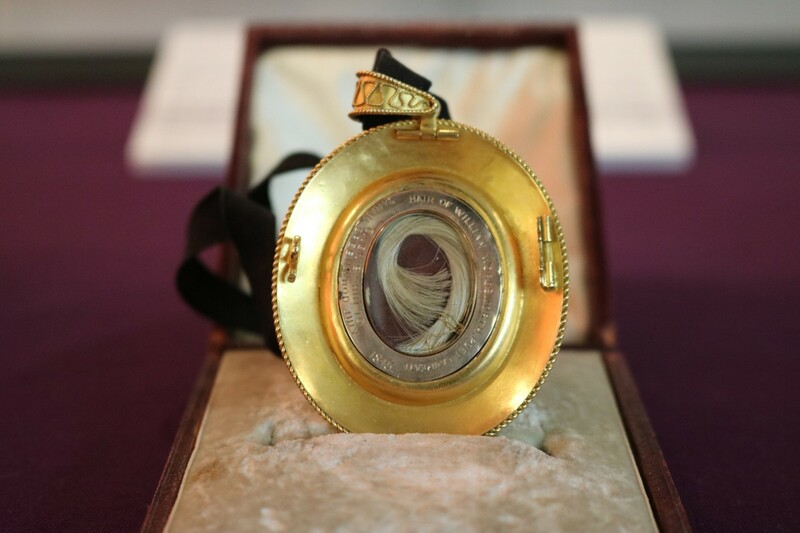 Did you know that we own a pendant with a lock of William Wordsworth’s hair? Research into the origins of this pendant led us to an unexpected connection to another author: Charlotte Brontë. Although a portion of their careers overlapped chronologically, Wordsworth and Brontë were not associated by social connections or by their writing. Rather, they are connected in this story only by the owner of the pendant – Sarah Greenwood. Sarah was acquainted with Wordsworth through her uncle, John Bolton, and is known to have been a friend to Mary Wordsworth. The Brontë sisters showed an active interest in the slave trade (still in force in their life-times) having first-hand knowledge of the campaign to end it and of William Wilberforce who had sponsored their father through St. John’s College. Sarah father and uncle had both benefited from the trade of slaves, and her brother Thomas later inherited Storrs Hall, the home of their uncle. The question has been posed by Brontë biographers – did Thomas visit his sister at Swarcliffe Hall so that the conversation could have turned to the West Indies and Spanish Town in Jamaica, to be overheard by Charlotte? May she also have heard of John Bolton from her brother Bramwell who was resident in the Lake District near Storr Hall? Could the character of Bertha Mason in Jane Eyre have been shaped by such conversations?